Why is Caltrain spending $2 billion on electrification & closing SF on the weekends? Caltrain is spending $2 billion to electrify the entire railway from SF to Tamien, and buy new train cars. This is expensive and painful - weekend headways are 90 minutes, and the 4th and King/22nd St. stations won't get trains on Saturdays and Sundays for about six months. Why is Caltrain doing this? There are a few reasons. Faster trains. With the diesel trains the only car that can accelerate is the locomotive. With the new cars, every car will be capable of pulling electricity from the overhead line - they are called "electric multiple units" because you have multiple cars that can each accelerate independently. This means the trains can accelerate and decelerate much more quickly a diesel engine can — the riding experience will be similar to riding BART. More frequent service. If the trains can get from end to end faster, you can run more trains. Further, since every train is capable of being the "engine", it's less painful to run shorter trains, more frequently during off-peak times. Think "not having to worry about catching the Giants Special, because the trains run every 15 minutes no matter what." Less respiratory disease. Diesel trains burn, well, diesel, in order to operate, which means the air gets pretty dirty. Pollution is a leading cause of respiratory diseases like asthma and bronchitis, not to mention permanently accelerated aging of the lungs, and killing plants along the railway. Burning diesel also contributes to the slow warming of the planet, which causes more fires and flooding. Electrification means the trains need less energy to run and also that energy burns cleaner, which should lead to cleaner air and healthier communities. Those are the main reasons to spend $2 billion on electrifying Caltrain. You might be saying, the US is not great at delivering infrastructure projects for a reasonable budget, is $2 billion a reasonable amount to spend? The answer is largely, Yes. The San Mateo County grand jury just investigated the contract award and decided that Caltrain was implementing best practices in both the award of the contract and the oversight. We are not out of the woods yet. Last year the California Legislature passed a twelve-cent-per-gallon tax on gasoline, which is being used to fund road repairs and transit improvements up and down the state. Caltrain is depending on this revenue to help fund the electrification project. 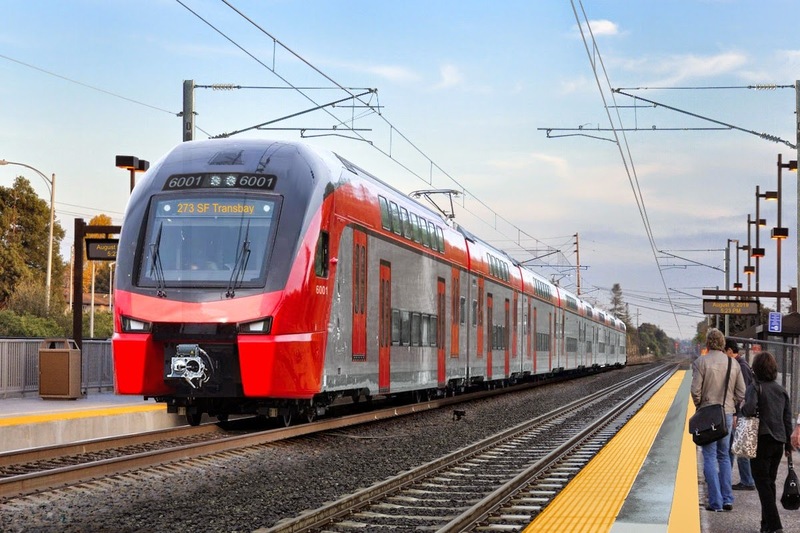 This fall, voters will vote on whether that tax should be repealed, which would hurt Caltrain's ability to fund electrification on time and on budget. Please vote no on Prop 6 this fall. Previously I wrote about pedestrian/bike improvements for the east side of 101. There's now a proposal for the east side exit of 101, shown in this slide at a recent Caltrain board meeting. It's not ideal to have pedestrians and cyclists on the north side of East Grand for two reasons: ped/bike crossings will hold up shuttles merging onto East Grand, and peds/bikes have to go out of the way up to the East Grand/Grand intersection and then cross two signals - one with a 30 second wait time and the other with a 42 second wait time. If one of the sidewalks in that photo is supposed to be a bike path, it's currently in poor shape and it's not clear there are plans to repair the surface. In an ideal world, bikes/peds could just cut straight across to the Gateway/East Grand intersection like this. This would cut at least a minute off of pedestrian travel times and extend the walkshed that much further. I believe SSF owns the right of way where the bottom red line is located. Could SSF, Caltrans, and SamTrans staff advocate for a ped/bike crossing on the south side of East Grand, that would allow ped/bike to travel on the south side of the intersection, saving a circuitous route for bikes and pedestrians? Ultimately this will require a decision that it's more important to prioritize Caltrain riders, even if it means a slightly longer delay for car traffic. The city of South San Francisco is the ultimate decision maker here, but they would appreciate your input on good design outside the station area. Contact the City Council: council@ssf.net and the Bike/Pedestrian Advisory Committee: BPAC@ssf.net. There are several factors that predict suicide incidence. There are several factors that have been demonstrated to reduce suicide incidence. Together these suggest that Caltrain may be able to take steps to reduce the incidence of suicide. Caltrain has no dedicated source of funding, and staff time is extremely valuable, so it's understandable that this hasn't been a focus area, and it's also extremely likely that it won't be possible to make improvements in these areas for some time. Psychopathy/psychiatric hospitalization. An above average number of victims have a documented psychiatric history. One paper suggests that track areas near psychiatric facilities are higher risk areas for attempted suicides. We could map Caltrain's passenger strikes against psych facilities on the Peninsula corridor, and invest in fencing in those areas. Easy access to train tracks: In many cases railway suicide attempts are impulsive and not very well thought out. "24% of the people who made near-lethal suicide attempts took less than 5 min between the decision to kill themselves and the actual attempt, and 70% less than 1 h," according to Miller and Hemenway (2008). Frequency of train service: The more trains that run the more suicides there are. This is a risk factor for electrification, which plans to increase rail frequency. Knowing someone who has committed suicide: there is a contagion effect where one suicide may lead to others; either sensational coverage of a suicide or a community member committing suicide may prompt copy cats. What are the costs of suicide? Loss of life: Branches of government like the US DOT assign a statistical value between $5 million and $10 million to a single life when evaluating safety improvements. This suggests an investment of $3-4 million in railway safety is a net positive if it saves a single life. Loss of railway service: Train strikes frequently result in death, and trains cannot begin moving again until a coroner can come on site to evaluate the cause of death. This can result in delays of several hours. This results in lost revenue — commuters may choose not to ride the train if the arrival time is unpredictable — and lost productivity from missed meetings, work time and so forth. Employee trauma: The psychological effects of striking people on the railway have not been as well studied, but some drivers experience severe reactions to striking people. This increases the cost of hiring and trauma management. What measures can prevent suicide? Platform Screen Doors: Subways in Singapore and Hong Kong saw a significant reduction in suicides - 59% - after installing screen doors at some stations. Suicides did not increase at other stations without screen doors, either, which fits with a characterization that suicide is an impulsive behavior, and deterring people with a suicidal impulse is enough to lower total rates of suicide. Tasha Bartholomew suggested that on the Caltrain line about half of suicides occur in station areas and half do not. The requirement to have freight traffic on the corridor and potential FRA regulations around such may also make it impossible to add platform screen doors. Still, we could evaluate the possibility of platform doors at new stations or identified hotspots. Media Training: Between 1984 and 1987 there was dramatic coverage of subway suicides in Austria and a corresponding spike in suicides. In 1987 a group developed media guidelines for suicide coverage and the suicide rate promptly dropped by 80%. Suicide rates by other means also declined suggesting no substitution. Telling the audience where to find help, providing background information about suicidal behavior, and what to do with people with suicidal thoughts. The Caltrain social media team should be praised for speaking about passenger strikes and trespassers in generalities - never providing details and only providing photos/video in incidents that did not lead to injury. There are only a few reporters and outlets that cover Caltrain regularly so working with them may pay dividends if we are not already doing it. Reducing access to the railway more broadly: This can come in many forms besides platform doors - grade separations, more fencing, ticketed station areas, identifying hot spots like mental hospitals and increasing fencing there. Several places on the Peninsula are considering grade separation projects — Palo Alto, Burlingame, others — and reducing pedestrian access to tracks should be a key consideration above and beyond grade separating cars and trains. "Suicide pits" (deep channels between rails): Some stations in the London Underground have a pit three feet deep between the rails at stations. This allows people who have second thoughts to duck below the train, and reduce the potential for the train to drag people along with it, and thus cause further injury. Strikes at Underground stations with pits are less likely to lead to fatalities than stations without them. This may be worthwhile to install at new stations such as the Hillsdale station (if it is not already being considered). Train design: Fatal pedestrian/car accidents have been on the rise due to Americans buying larger cars with a higher front profile. Similarly, the design of the train engine may make strikes more or less deadly depending on the design. A lower point of impact and a skirt which makes it impossible for a body to go underneath the train may reduce the likelihood of a fatal injury. An airbag that was deployed concurrently with the emergency brake could also reduce the impact of a collision. There is not enough research into the effect of these changes, though they may be cheap to implement relative to grade separations or screen doors. Given the lack of research here, perhaps a rail safety study sponsor could fund a modified skirt design on half of the new engines that Caltrain is ordering. We could then measure the injury and fatality rate of train strikes with the modified skirt and the original design. Blue lights: A study in Japan got attention for saying that blue LED lights at station platforms led to a lower number of suicide attempts. A later study found that the effect of blue lights was not measurable.